Ron Scollon characterises the relationships of language, objects and space as ‘mediated discourse’. One morning recently in San Diego, California I had a cup of coffee at the international chain coffee shop, Starbucks. After a short time in the queue I ordered a tall latte and another drink for my friend. I paid for the drinks and then waited a few minutes while the drinks were made and then delivered to me. We took the drinks and sat down to drink them and have a conversation. As linguists and perhaps only linguists do, in and among the other topics of conversation we talked about what was printed on the cup. In having this cup of coffee I could say there is just a single action – having a cup of coffee as is implied in the common invitation, `Let’s go have a cup of coffee.’ Or I could say there is a very complex and nested set of actions—queuing, ordering, purchasing, receiving the order, selecting a table, drinking coffee, disposing of our cups and other materials, and the rest. Likewise, I could say there is just one discourse here—a conversation among friends. Or I could say there are many complex discourses with rampant intertextualities and interdiscur­sivities—international neo-capitalist marketing of coffee, service encounter talk, linguistic conference talk, family talk and the rest. 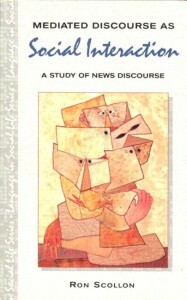 Mediated discourse analysis is a position which seeks to keep all of this complexity alive in our analyses without presupposing which actions and which discourses are the relevant ones in any particular case under study. As a way to at least temporarily narrow the scope of my analysis here, I want to focus on the coffee cup. It can be called the primary mediational means by which the coffee has been produced as something transferable, delivered to me, and ultimately consumed. Without the cup there is no ‘having a cup of coffee’ in the literal sense. Throughout all the other actions which take place, the cup figures as the material line that holds this all together. From the point of view of an analysis of mediated action, then, we would want to consider the cup—a paper one in this case—absolutely central to both the narrowly viewed actions of delivery or drinking and to the more broadly viewed actions of consumer purchasing/marketing or of ‘having a cup of coffee’ as a conversational genre. If we come to this social interaction from the point of view of discourse analy­sis, and if we set aside for the moment all of the complexities of service encounter talk and of casual conversation between friends, we still find that the cup itself (with its protective sleeve) is an impressive semiotic complex of at least seven different Discourses in the broad sense defined by Gee. 1 Commercial branding: There is a world-wide recognizable logo which appears twice on the cup and once on the cardboard protective sleeve. 2 Legal: The logo is marked as a registered property (®) and the text on the sleeve is marked as copyrighted (©). A patent number is also given. In add­ition, there is a warning that the contents are `extremely hot’ which derives from a famous lawsuit against another international chain where a customer had held a paper cup of their coffee between his legs while driving and been uncomfortably scorched. 3 E-commerce: A website is given where the consumer can learn more, though it does not indicate what we might learn about. 4 Consumer correctness: An extended text tells us that the company cares for those who grow its coffee and gives a telephone number where the consumer can call to make a donation to CARE on behalf of plantation workers in Indonesia. 5 Environmental correctness: We are told that the sleeve is made of 60% recycled fiber and that it uses less material than would a second paper cup. The color scheme is in natural cardboard brown with green lettering which are widely associated with environmental friendliness. 6 Service information: ‘There is a printed roster of possibilities (`Decal, `Shots’, `Syrup’, `Milk’, `Custom’, and `Drink’) and superimposed is the handwritten `L’ (for `latte’). 7 Manufacturing information: Under the cup around the inside rim is the information about the cup itself, its size, and product labeling and number. On the one hand we have a fairly clear and mundane social action—having a cup of coffee in a coffee shop—and a semiotic complex of Discourses which are also, at least now at the beginning of this century, rather mundane. We have an array of analytical positions from which we can analyze this action, from seeing it as participating in a bit of micro-social interaction to seeing it as participating in the world-wide consumer practices of neo-capitalism. At the same time we have an array of analytical positions from which we can analyze the Discourses repre­sented in these texts printed on this coffee cup. The problem that mediated discourse analysis is trying to engage is how we are to work out a way to under­stand the relationships among the actions – drinking the cup of coffee – and the Discourses. The unit of analysis of a mediated discourse analysis is the mediated action (not the Discourse or text or genre). That is, the focus is on social actors as they are acting because these are the moments in social life when the Discourses in which we are interested are instantiated in the social world as social action, not simply as material objects. … [A]ction is materially grounded in persons and objects and that it is unproductive to work with purely abstracted conceptual systems of representation. Participation in the world-wide consumer society requires at some point the transfer of coins and cups, speaking and drinking. Conversely stated, this transfer of coins and cups and speaking and drinking inevitably entails participating in the consumer society. There is no action without participating in such Discourses; no such Discourses without concrete, material actions.